A highly addictive and illegal drug, heroin is sold in three different forms: black tar heroin, brown powder heroin, and white powder heroin. Each kind of heroin contains slightly different ingredients, and all are likely to have various other substances added, which can add to the drug's potency, in some cases making it even more dangerous. Heroin is usually a mixture of diacetylmorphine, the active ingredient that produces the drug effects, and a variety of filler ingredients. Some of these fillers are other opiates, and share some of the ​psychoactive effects of heroin, whereas others are simply powders that share the appearance of the form of heroin they are cut with. And in some cases, the add-ins are toxins that can cause deadly side effects. Diacetylmorphine, or diamorphine, is a is a highly potent painkiller that occurs naturally in the latex sap of the seed pod of the opium poppy, known as opium. The opium poppy grows in many parts of the world, including Asia, Australia, some parts of Europe, Turkey, Afghanistan, Colombia, and Mexico. This opiate is the main psychoactive ingredient in heroin, which produces the euphoric heroin high. It is also what gives heroin its addictive qualities and creates a state of physical dependence among its users; the more someone uses, the more they need to avoid withdrawal symptoms. Deaths related to synthetic opioid overdose has risen by more than 300 percent in the U.S. since 2013. This is mainly due to the contamination of heroin and other drugs with illicitly manufactured fentanyl, an opioid painkiller, which is many times stronger and more dangerous than heroin. Research shows that drug users are concerned about fentanyl in their heroin, and most are open to using rapid test strips, which can be used to detect the presence of fentanyl in drug samples (before use) or urine (after use) and can help inform people about their exposure risk. In addition to diacetylmorphine and fentanyl, street heroin may contain a variety of other street and prescription drugs, including methamphetamine. Although meth is a stimulant and heroin a relaxant, both produce feelings of euphoria, so a drug dealer can often get away with mixing any euphoria-producing psychoactive drug with heroin if it is available at a cheaper price. Meth carries its own risks and typically contains toxic chemicals, making it particularly unsafe to inject directly into the bloodstream. Black tar heroin looks like a sticky or hard ball or chunk of blackish brownish substance. It is produced by a very crude process in which the opiate that is produced is relatively unrefined compared to white powder heroin. It contains several partially processed forms of opiate, which differ from heroin. Although black tar heroin has been around for over 100 years, its popularity in the United States began in the 1970s because it is cheaper and easier to make than white powder heroin. Further processing of black tar heroin, and cutting with lactose, can produce brown powder heroin. White powder heroin in its purest form is a salt form of the drug, known as diacetylmorphine hydrochloride, although it will typically be mixed or "cut" with other white powders, which reduce the potency and increase the risk of contamination and vein damage if the drug is injected. 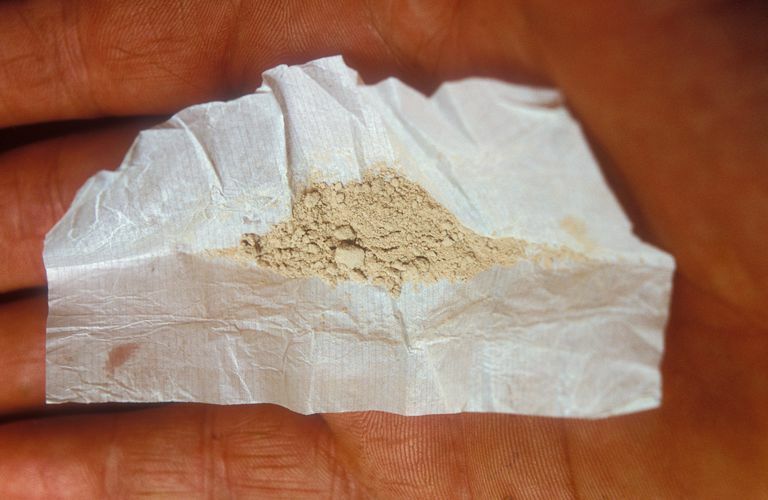 Typically, the purer the heroin, the whiter and shinier it appears, while the more heavily cut the heroin, the duller the white powder appears. The process of making heroin from opium varies, depending on the methods used, and the facility in which it is made. These facilities range from state-of-the-art legitimate laboratories run by fully qualified chemists, to clandestine labs run by illicit drug manufacturers, to makeshift processes using old oil drums and outdoor fires run by local growers with little or no education in chemistry. Recently, heroin has been manufactured in home labs by people attempting to convert prescription painkillers such as oxycodone into street heroin. There is no way to know the point of origin or additional ingredients of heroin purchased on the street. It may contain contaminants that are by-products of the manufacturing process, including chemicals such as calcium oxide, ammonia, chloroform, hydrochloric acid, and acetic anhydride. Street heroin may contain local anesthetics, such as xylocaine. Although anesthetics themselves legally used for medical and dental purposes, they do carry risks, can have side effects, and are also potential allergens, carrying additional risks of adverse health effects, which may not be recognized or properly treated by users or dealers. Filler ingredients are added to bulk up the heroin so that dealers can increase their profit margins. They vary from benign substances, such as talc, flour, cornstarch, powdered milk, and various sugars, to harmful substances. For example, black tar heroin may be diluted with black shoe polish or dirt. Quinine is sometimes added to white powder heroin for its bitter flavor. It's also possible for poisons to be cut into heroin. Strychnine, which is used as a pesticide used in rat poison, is one toxic ingredient sometimes mixed with heroin. As it is to rats and other mammals, strychnine is lethal to humans. Psychological symptoms of strychnine poisoning include anxiety, restlessness, agitation, and an increased "startle" response. Physical symptoms include jaw tension, muscle pain and spasms, rigidity of the arms and legs, and arching of the neck and back. Black tar heroin may be cut with soil, which can contain the spores of a toxic contaminant called Clostridium botulinum. If that name sounds vaguely familiar, it may be because it causes a potentially fatal kind of food poisoning called botulism. If these spores get into a wound, which commonly occurs when injecting black tar heroin, the spores can germinate and cause wound botulism. Even though the wound may appear small, the infection is extremely serious. Wound botulism produces local neurotoxins, which cause a symmetrical, flaccid, descending paralysis of the voluntary muscles, meaning you can't move your muscles when you try, progressing to becoming unable to breathe without assistance, and eventually death if untreated. Botulism poisoning can cause death. The symptoms of botulism poisoning will not be helped by naloxone, a drug often used to reverse heroin overdoses. Although not actually an ingredient in heroin, people who burn heroin on aluminum foil to inhale the fumes—a practice known as "chasing the dragon"—may have elevated levels of aluminum in their urine. Aluminum is known to be a neurotoxin, although the long-term effects on heroin users still need to be established. Exley C, Ahmed U, Polwart A, Bloor R. Elevated urinary aluminium in current and past users of illicit heroin. Addiction Biology;12(2):197-199. 2007. Frances R, Miller S. and Mack A. (Editors). Clinical Textbook of Addictive Disorders. 4th edition. New York: Guilford. 2016. Krieger M, Yedinak J, Marshall B, et al. High willingness to use rapid fentanyl test strips among young adults who use drugs. Harm Reduction Journal ;15(1):7. 2018. Mars S, Bourgois P, Karandinos G. Montero F, Ciccarone D. The textures of heroin: user perspectives on "black tar" and powder heroin in two U.S. cities. Journal of Psychoactive Drugs 48(4):270. 2016. Summers P, Struveb I, Wilkes M, Rees V. Injection-site vein loss and soft tissue abscesses associated with black tar heroin injection: A cross-sectional study of two distinct populations in USA. International Journal of Drug Policy, 39:21-27. 2017.